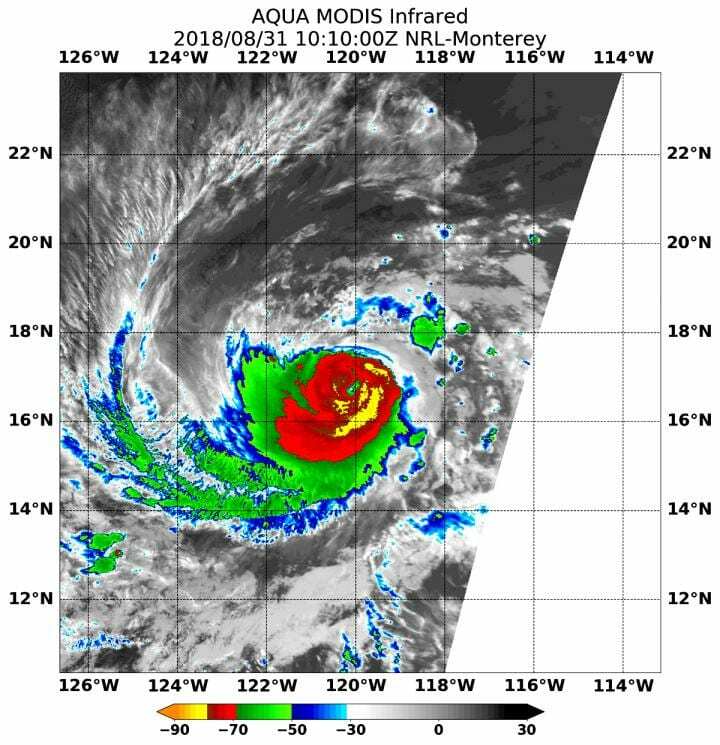 NASA's Aqua satellite provided valuable infrared temperature data on Category 4 Hurricane Norman that showed its strongest storms were southeast of center. On Aug. 31 at 6:10 a.m. EDT (1010 UTC) the Moderate Resolution Imaging Spectroradiometer or MODIS instrument aboard NASA's Aqua satellite found the coldest temperatures of the strongest thunderstorms in Hurricane Norman were southeast of the center and were as cold as or colder than minus 80 degrees Fahrenheit (minus 62.2 Celsius). They were embedded in a large area of storms where cloud top temperatures were as cold as or colder than minus 70 degrees Fahrenheit (minus 56.6 degrees Celsius). NASA research has shown that storms with cloud top temperatures that cold (that are very high in the troposphere) have the capability to generate heavy rain. There are no coastal watches or warnings in effect as Norman is far from land. It is 825 miles (1,330 km) west-southwest of the southern tip of Baja California. The National Hurricane Center (NHC) noted at 11 a.m. EDT (1500 UTC), the eye of Hurricane Norman was located near latitude 16.7 degrees north and longitude 120.8 degrees west. Norman is moving toward the west-southwest near 8 mph (13 kph). A turn toward the west and west-northwest with an increase in forward speed is expected over the weekend and into next week. Maximum sustained winds have decreased to near 130 mph (215 kph) with higher gusts. Norman is a category 4 hurricane on the Saffir-Simpson Hurricane Wind Scale. Hurricane-force winds extend outward up to 25 miles (35 km) from the center and tropical-storm-force winds extend outward up to 90 miles (150 km). Gradual weakening is forecast, but Norman is expected to remain a powerful hurricane through the early part of next week.